Mr Hamoda is a Consultant Gynaecologist and Subspecialist in Reproductive Medicine and Surgery at King’s College Hospital, London. He qualified in 1994 and was admitted as a member of the Royal College of Obstetricians and Gynaecologists in 2000. He was awarded the degree of Doctor of Medicine (MD) from the University of Aberdeen in 2007. 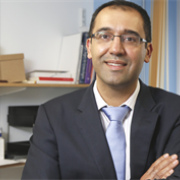 He is accredited as a subspecialist in Reproductive Medicine and Surgery after completion of the subspecialty training programme at Guy’s and St Thomas’ Hospital. His areas of clinical expertise include infertility and assisted reproduction, menopause and premature ovarian failure, gynaecological ultrasound scanning, gynaecological endocrinology including PCOS, management of fibroids and endometriosis, minimal access surgery, miscarriage and menstrual disorders. He has published widely in his specialised field, including both book chapters and papers. He is also a co-author of the British Menopause Society guidelines 2013 on the management of the menopause, and is a member of the Medical Advisory Council for the British Menopause Society. In addition, he is actively involved in ongoing research projects both locally and nationally, and teaches at both undergraduate and postgraduate level. Mr Hamoda is an approved healthcare provider for most major healthcare insurance services.